According to ESPN, everyone is going nuts over Juvenuts. 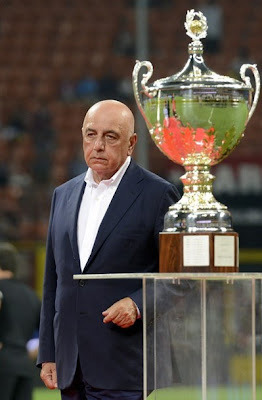 So with the promise that Juvenuts just killed their Scudetto hopes by winning a meaningless trophy match, Milan should feel pretty good about tonight. For one, Antonini had some lovely crosses, at least until he was fouled hard by Padoin in the 35th. And although he came back on, he was subbed out at the half, hope he’s okay. Funny, too, because early on the commentators were saying that it was “the problem position” for Milan. Little did they know that this season, every position is a problem position. But some things are hopeful. Robinho has looked great preseason, and tonight was no exception. Playing the lone striker in a Christmas tree formation that was probably improvised due to the last minute loss of Cassano & El Shaarawy for this match, he opened the scoring in the 9th minute. 1-0 Milan. Yes, we LOVE the way you're playing, Robinho! Unfortunately, the celebrations were cut a bit short as De Ceglie and Marchisio connected beautifully to equalize in the 12th minute. 1-1 But there were other shots for Robinho, Urby looked solid, too, and I think that other than some rough tackles (like stepping all over Lucio in the 37th,) that might be the best I’ve seen Boateng play all summer. I hope Allegri liked this formation, as the 4-3-3 just hasn’t been successful. I am going to go out on a limb and say that Milan outplayed Juve for the first 45 minutes. Vidal was given a yellow card in the 12th minute for a harsh foul on Montolivo, that seems to be his specialty. But despite some excellent chances from both sides, it was Vidal who gave Juve the lead in the 42nd with a massive Milan defensive blunder. 2-1 Juve. I believe the commentators observed that Antonini “Just stopped running.” Okay, he started out strong. At the half, Juvenuts used seven substitutions. I don’t even know if Milan had seven players to substitute. We did, however sub on Pato for Urby, and De Sciglio on for Antonini. Nocerino then came on in the 52nd for an injured Abate. Despite Boateng opening up Pogba’s face in the 48th, Juvenuts’s subs were definitely turning the tables. One sub, specifically, being Matri. He gave our defense and Abbiati all kinds of trouble, until in the 64th, despite Abbiati making a huge save not 30 seconds earlier, Matri scored for Juvenuts. 3-1 Juve. Traoré replaced Flamini in the 53rd, and then in the 80th, Valoti came on for Boateng. Yepes got a yellow in the 65th courtesy of contact with Quagliarella. Despite the defensive blunders, Zapata was huge on the night, impressing many times over with his pace and positioning. And in fact, in the 70th, he put a beautiful cross in for Pato at the other end, a header that unfortunately was saved. But it was the inexperienced center back Masi who took Robinho down in the 76th and earned himself a yellow and Milan a penalty. 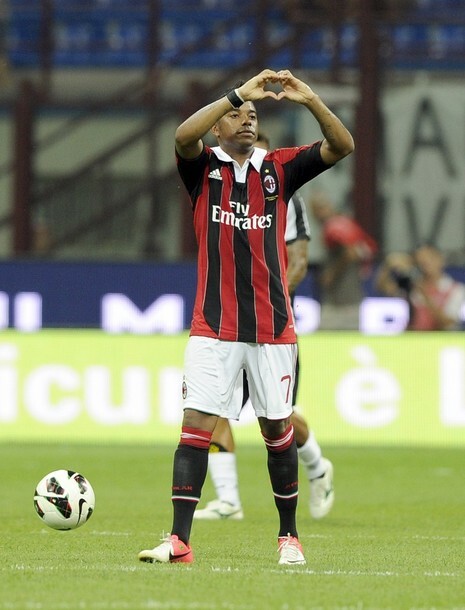 Robinho took it beautifully, uncharacteristic of his normal easy-shot blunders, to score for Milan in the 77th. 3-2 Juvenuts. Juve then kept Abbiati quite busy for the last 15 minutes, but Abbiati came up big again and again. And it seemed like our defense might have been thinking about some improved communication, too. With multiple shots from Matri, shots from Quagliarella, Giaccherini, and Pazienza, Juvenuts definitely dominated the second half. But Pato had a number of shots, and so did Nocerino, who took a shot that was saved to end the game. It’s the loss that was a win, and not just for the curse. We showed some bright spots where most of us thought were just black holes. And with several key players missing, we still managed to hold the Scudetto holders to only a 3-2 win. I am thrilled we have Zapata, he will only get better when communication improves, and with his Colombian national team captain and teammate in Yepes, I’m willing to bet we just found more use for Yepes, too. But I mostly loved the attack, this new formation is much better than the attempts at a 4-3-3, and I hope that Allegri saw that, too, so he can have a back up to his typical 4-3-1-2. Is Carrerra even better than Conte? Off the pitch, Conte was “watching from on high.” Which is perfect, since he said earlier this summer that he wanted to take Juve to the top of the world. Perhaps if he loses the appeal on his ban, he can take a trek to the North Pole and scope it out for Juvenuts’ return to the “top of the world.” He has nothing to worry about, though, so far his interim coach Massimo Carrerra has two trophies in two matches, so clearly he is even better than Conte. The Curva Sud unfurled banners which read “We don’t want Borriello” and also “Galliani, bring us a champion.” With ten days to go, Cassano and possibly Mexes poised to leave, Galliani truly does have his work cut out for him. It is my understanding that he met with Berlusconi tonight to discuss an increase in transfer funds. That could potentially make this week even better. But I am not going to lose any sleep over Juvenuts’ win tonight. In fact, I am quite pleased, because despite not being Italian, when my team loses, I like to think that it’s for the other team to be cursed. And I am too busy stressing out over the mercato still, as well as our first match vs. Sampdoria in one week’s time. It’s likely to be a lean year for Milan, testing our patience all year, but we do have some quality. And Juvenuts just cursed themselves to lose the Scudetto, so technically, Milan’s Scudetto hopes are still alive. Mercato Roundup: Tutti al Circo! Milan vs. Sampdoria: Game On! Milan vs. Sampdoria Preview: Let the Games Begin! Bakaye Traoré: X Factor or Non-Factor? AC Milan vs. Real Madrid: Game On! AC Milan vs. Real Madrid: Play Ball! Milan 3, Olimpia 1: Are You In?